Street Fighter EX 3 is PlayStation 2 game developed by Arika and published by Capcom in 2000. It was the sequel to Street Fighter EX 2 Plus. It was exclusive to the PS2, and was released as a launch title in all regions. 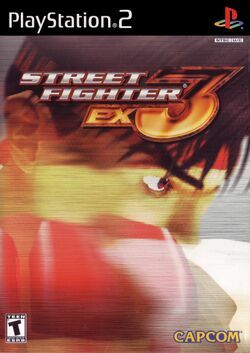 EX 3 is the last version of the Street Fighter EX series. EX 3 updates the game play found in EX 2 by adding tag teams, much like those found in the Marvel vs. Capcom series. At anytime, two buttons can be pressed to swap fighters, allowing the benched fighter to recover a little bit of health. In addition, some characters have Meteo Tag Combos that they can perform with select partners. This page was last edited on 10 October 2012, at 23:43. This page has been accessed 26,023 times.